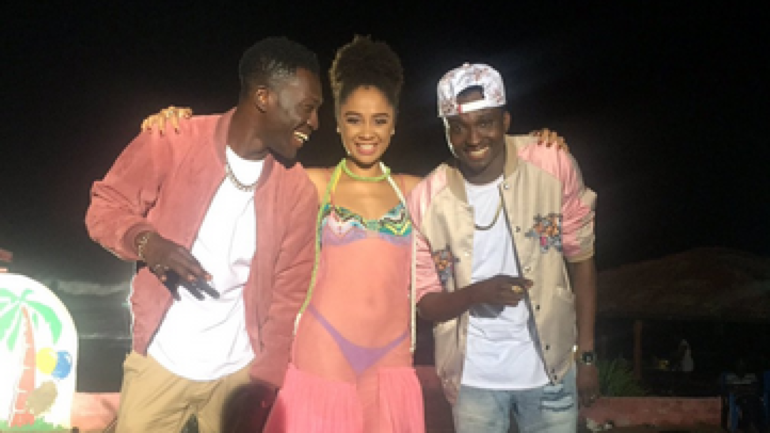 Multi-talented Ghanaian musician and model, Deborah Vanessa, says she’s planning to take legal action against 2015 X-Factor UK Ghanaian finalists, Reggie N Bollie, for deceiving her into believing that she was going to be part of the duo’s music video which was shot in Ghana. Speaking to ScrewLife.Com on the issue, Sister Deborah, as she’s affectionately called in showbiz, said she cannot comprehend why Reggie N Bollie decided to cut her part out from the video. According to her, she put on display all her dance skills in order to market herself to the world through the music video so it’s unfair on their part to treat her in such manner. Teary-eyed Deborah Vanessa revealed to us that she was the one who convinced Reggie N Bollie to come and shoot the music video in Ghana. She further stated that she developed the concept of the video for the duo. In exchange, Reggie N Bollie were supposed to feature her in the video, which they did, but cut her part out during the editing stage. According to Ghana’s most sought after female singer and model, she is currently in talks with a Ghanaian UK-based lawyer to help her sue the duo and by the time she’s through with them, they would know their smoothness level. Naa Ashorkor Throws Back To When She Could Eat Everything Without Getting FAT- Check Photo!